Meat is not a necessary component of your food storage. There are other sources of protein like beans, peanut butter, nuts, and even broccoli. However, I like meat. My family likes meat. If you like meat also, here are 7 ways to get it in your food storage. 1. Freeze it. Meat in the freezer has a shelf life of 6-12 months. If you seal it with a vacuum sealer, that life can be extended up to 3-5 years (based on my own personal experience). However, meat in the freezer will only stay good as long as your freezer works. If the power goes out for an extended period of time, the frozen meat will need to be cooked and eaten quickly or it will go bad. Unless, of course, the power goes out in the middle of winter and it’s below freezing outside–then you can keep it frozen in a cooler outside your house as long as the weather cooperates. 2. Dry it into jerky. Or buy jerky. Depending on how it’s packaged (and how many preservatives are in the commercial kind), jerky keeps for 6-18 months. That is, if you can keep it hidden, because you know if jerky is hanging around where the little people and husbands can find it, it won’t last long at all. 3. Bottle your own meat. 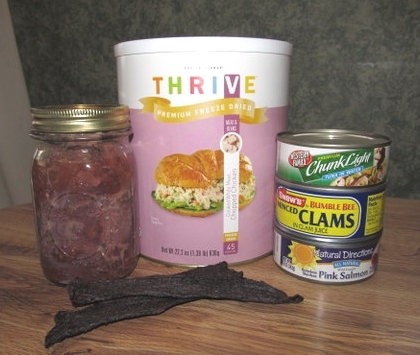 Home canned meat is shelf stable, pre-cooked, and properly stored has a shelf life of 5 years. You can bottle game meat, beef, pork, chicken, turkey, and even fish. 4. Buy commercially canned meats. These include canned meats like chicken, tuna, salmon, and other seafood. You can also purchase canned bacon, beef, pork, and of course SPAM. There is quite a quality spread in commercially canned meats, so you may want to buy one and try it before you purchase five cases and decide you really don’t like it. Shelf life on canned meats varies but averages about 5 years. A subset of this option is any commercially canned products containing meat like spaghetti sauce, soups, chili, ravioli, etc. that have meat included in them. 5. Freeze dried meats. Freeze dried meats are flash frozen then put into a vacuum chamber to remove the moisture. When re-hydrated, they retain the flavor and texture of fresh cooked meat. They are a little more expensive than some of the other options, but have a shelf life of 25 years. You can get chicken, turkey, beef, ground beef, sausage, and ham. 6. Stock the means to hunt, trap, or fish for meat. Proper firearms and ammunition or archery equipment for hunting, appropriate sized traps or snares for trapping, and fishing hooks, poles, and gear for fishing. I would recommend not making hunting your primary means of providing meat for yourself or your family. Right now, herds are managed by local wildlife agencies for a certain sustainable population. If all heck breaks loose, the herd numbers could be reduced quickly to unsustainable levels, meaning hunting, especially for large game, would no longer be a viable option for providing meat. With any of these methods, practice now. There is a learning curve. 7. Keep livestock. Even in small yards you can keep animals like rabbits, chickens, and other poultry. On a larger plot of land you can keep larger animals like cows, sheep, and pigs. If you plan on this being a long term meat provider, make sure you have at least one breeding pair of the animals you are keeping. You’ll also need to be able to keep the animals fed, so add their feed to your plans. What about you? 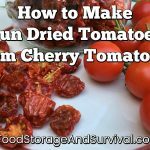 Do you have meat in your food storage? What is your favorite method? Right now only have what’s in the freezer (vaccuum sealed though). Hopefully in March we will be getting some Freeze Dried Meats, and also canned tuna, canned salmon that we like. Do have some meat substitutes, but would prefer the more expensive freeze dried meats. Lots of beans, as we love them and they are good for you too. P.S., do you know how long dried plain gelatin is good for, I mean do you know how long it can be used past the expiration dates on the packages. I know gelatin powder is a source of protein. How long well rice last in 2lt bottle? If it’s sealed well it will last 20+ years. How can I preserve “Garlic” for cooking? I called the extension office they told me NEVER put Garlic in oil use and keep it on the counter it can cause botulism. How about storing Onions, I have Dehydrated some. I cut and Freeze them. Another ways? Cheese _ Grated kind you grade on top of pasta Romano It’s so dame expensive. The way I do garlic is to 1) peel it 2) dehydrate it 3) powder it. I use a garage sale coffee grinder. (Cheap!) Do this OUTSIDE! If you try to dehydrate garlic or powder it in your house, you may have to stay in a motel for a few days. This makes some industrial strength garlic.